Taco seasoning by Tone’s, chopped tomatoes, onion, celery, yellow capsicum (a sweet pepper), New Mexico red chile gravy, and ground beef, cooked together about an hour and mixed until very fine, makes a perfect taco filling in combination with grated mild cheese. Miniature tacos are made with sautéed Guerrero corn tortillas, which are filled with a ground-beef-vegetable mixture and colby jack cheese. The bowl contains shredded Romaine lettuce and small strips of avocado, dressed with lime juice, cilantro (coriander leaf) and salt. On a cutting board covered with two sheets of waxed paper spread with a bit of flour, oregano, and garlic powder, cut white meat pork chops into bite-sized cubes. Fold waxed paper and shake the pork cubes, distributing the seasoning. In a skillet heated and prepared with a tablespoon of lard, fry the pork until outsides are brown. Drain off the excess melted fat. Add red chile sauce that has been prepared from lard, browned white flour, water and red chile powder of New Mexico (pure ground chiles with no additives–that means no cumin), and salt. Mix the sauce into the pork, and simmer for one hour, stirring often and adding more water or chile sauce to keep it moist. Serve with warm, soft white flour or corn tortillas. In an alternate, slow version of this dish, the pork pieces would be marinated in the red chile sauce for two days, dried with a towel, seasoned as above, and fried in lard. Then the additional chile sauce would be added and the carne adovada simmered until tender. To make red chile sauce from whole, dried New Mexico chiles, boil them in a pot with 2 parts water, and when soft, put them in a blender and purée them until smooth, with as much of the cooking water as necessary. Into a roux made with lard and flour, gradually add the chile paste and water until you have the desired consistency. I add salt, a pinch of fine oregano (pictured in red vase on left) and NO cumin (it’s not considered traditional for this New Mexican red chile gravy). Use this red chile sauce to marinate your pork cubes for two days in the refrigerator, before cooking, as described above, carne adovada. Note: adobada or adovada in New Mexico, means “cured” or “pickled”. In the quick method as described in the beginning of this recipe, the process is accelerated. Traditionally, pork chunks are marinated for two days in the chile sauce before cooking. Sauté ground beef or shredded chicken with onion and pure red chile powder. 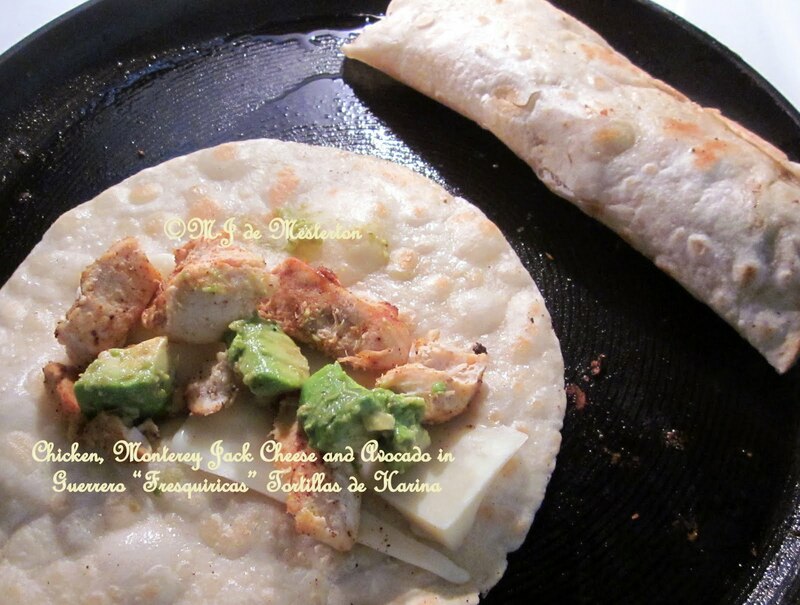 Fill flour tortillas with the mixture, adding Monterey jack cheese to it. Sauté the stuffed tortillas in olive, peanut oil or butter for a few seconds each side, and then top them with green chile gravy and shredded cheese–either cheddar or Monterey jack. To make green or red chile gravy (for this recipe I use green): heat a fourth-cup of oil, butter or lard in a frying pan or pot. Add a third-cup of flour and stir it till it begins to brown. Salt to taste. Add water or milk (milk if you are making green chile gravy), using a potato-masher on it till the sauce is smooth. 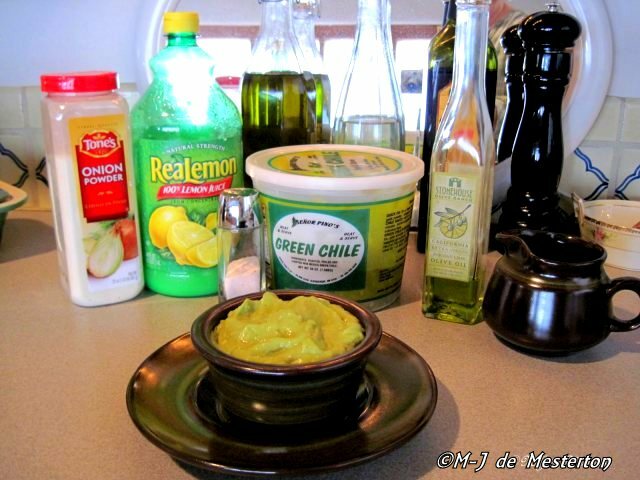 Add your red or green New Mexico chile powder. I usually incorporate a small can of Hatch chopped green chiles into the green version. Keep at this with a potato-masher or wooden spoon till it is the consistency that you prefer. Cover your assembled burritos with the green chile gravy and cheese, then bake for ten minutes at 350F. There are some people selling ristras (see architecture page) and dried green and red chile powders at the corner of St. Francis and Alameda in downtown Santa Fe. Look for the big truck with “Rachel’s Corner” and some red chiles painted on its side. Their dried chile powders will enable you to eat well all winter. NEWS: NORTH of the BORDER CHILE Co. sells green chile powder on the internet, and a whole range of New Mexico seasonings. There are so many recipes for guacamole that contain anti-social ingredients like raw garlic and/or onions. My elegant, all-green version contains avocados, lemon or lime juice, olive oil, strained or dried green chiles, a hint of onion powder and some Himalayan salt. No tomatoes, please! Elegance, purity of flavour and colour go hand-in-hand. Huevos Rancheros–-fried eggs and grated cheese on tortillas with red or green chile gravy on top–are a health-promoting breakfast or brunch dish for winter and fall. Placing refritos, or refried beans, under the eggs is optional. Use either flour or corn tortillas, with Monterey Jack or Cheddar cheese. I like to sauté the tortillas in butter, grate cheese onto them, then fry the eggs, assemble the lot and pour on the chile gravy, finishing the top with more grated cheese. Mix all ingredients together until they are incorporated. Gradually, drop-by-drop, add enough cold water to make it into a stiff dough. Wrap the resultant ball of dough in plastic or put it in a bowl covered by a towel, and let it sit for one hour. Roll about 1/4 inch or thinner. Cut into squares. Fry in very hot oil. Eat with green chile stew, red chile pork, salsa picante, or drizzled with honey for a traditional Santafecino dessert. In other words, your sopaipilla is a platform for any edible New Mexican embellishment. Use regular biscuit dough, omitting the shortening. Make sure that the dough is of stiff consistency so that it will not stick to the counter. Add one egg and a teaspoon of sugar to the dough. Roll it out thin as for a pie. Cut strips about 1 1/2 inches wide and 2 1/2 inches long. Fry in deep, hot lard to brown on all sides. Drain on a wire basket or paper-towels. Sprinkle with mixed sugar and cinnamon, and serve with coffee or cocoa. The same dough may be used for tortillas, adding one tablespoon of lard. New Mexico Chile Harvest: Red or Green? Dried sweet corn used whole or crushed in a seasoned stew. Red chile pods blended with water into a purée and seasoned. Used in such dishes as carne adovada (marinated pork cubes). Found in a variety of sizes, shapes, and piquancies, they are an important part of New Mexican dishes. The skin of the chile pepper is often removed after blanching or baking. Used in sauces, relishes, stews, and as chiles rellenos. Green chile that has ripened and dried. Usually used ground or crushed for added seasoning, cooking pork and tamales, or in making green chile gravy and a variety of sauces.Ground or whole, the pods of red chile peppers are used in making New Mexican carne adovada. Red sauce made of mild-to-hot chile pulp or chile powder, spices, and beef or pork or both. Used for enchiladas. Also called red chile sauce. A moist dough of ground, dried corn that has been soaked in limewater, then cooked. Used in tamales. Beans. Most commonly used bean is the pinto bean. Black beans are not traditional in New Mexican cuisine. Refried beans. Pinto beans that have been boiled, mashed, fried in pork fat, and topped with longhorn or jack cheese. Blue corn meal flour for tortillas. Blue corn meal flour for gruel. Sprout wheat flour for Indian pudding (Panocha). Masa in dehydrated form to which water is added to produce dough similar to fresh masa. Brown, unrefined cane sugar found in cone-shaped pieces used to sweeten coffee and desserts. Pine nuts or pignolia–seeds of large pine cones. Used in desserts, cookies and breads, or roasted, salted and enjoyed as nut meats. A hot sauce or relish made of Jalapeño chiles, onions, either red or green tomatoes, and seasonings. Flour tortillas made from wheat flour. Tortilla means “little cake” (in Spain, a tortilla is an omelette with potatoes in it). Typically, flour tortillas are 7 – 10 inches in diameter and 1/4 inch thick. They remain mostly white after cooking on a griddle, but are flecked with brown and puffed in spots. Used for burritos and as an accompaniment to any Southwestern meal. Corn tortillas made from masa pressed into a thin pancake, then quickly singed or “blistered” on a hot griddle. Used for enchiladas, tacos, taquitos, chalupas, huevos rancheros, and tostadas compuestas. Flour tortilla filled with refried beans and chile sauce, ground beef and chile sauce, or a combination of both, and rolled. Poor man’s stew made of ground beef, raw potatoes, and seasonings. Pork steak marinated in chile sauce, then roasted or pan fried. Usually served with Spanish rice and refried beans. Beef or pork cut in thin diagonal strips and cooked quickly over very hot coals, as in a brasero or Japanese hibachi. Meaning “little boats,” is a fried corn tortilla topped with shredded chicken or beans, cheese, tomatoes, guacamole, and salsa. Blue corn meal much thicker than atole. 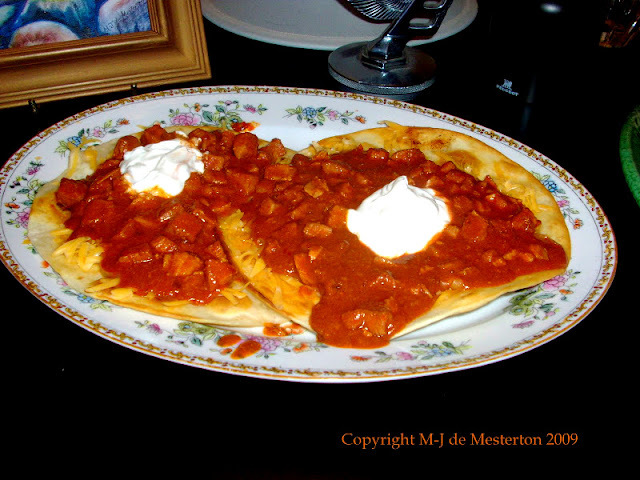 Served with red chile with pork or spareribs in place of potatoes or rice. (Cracklings) Pieces of fat cooked slowly until lard is rendered out. Lightly salted, may be served as a warm or cold hors d’oeuvre. Called tortilla hash or poor man’s dish. Includes leftover tortillas fried until crisp and combined with chile, eggs, jack or sharp cheddar cheese, and red chile sauce. Melted cheese dip seasoned with chile and served with tostados. Green chiles stuffed with cheese or meat, dipped in a cornmeal/flour batter, and deep-fat fried. Meaning “flute,” a taco variation; two corn tortillas are overlapped, filled with meat, cheese, onion, and chile, rolled, then fried. A cold vegetable soup with a meat broth or tomato juice base containing a variety of raw vegetables. Avacado salad served as a dip or on lettuce as a salad, or ingredient in many other dishes. Served in several ways, but generally is a fried egg on a corn tortilla and topped with a special green chile sauce with onions and tomatoes. Sometimes served with red or green enchilada sauce and garnished with lettuce and cheese. Tripe and hominy traditionally served on Christmas or New Year’s Eve. Sweet anise seed rolls. Usaully accompanied by Mexican chocolate. An hors d’oeuvre of tostados topped with jack cheese, sour cream, and jalapeño chile. A classic dish combining rice and a variety of both meat and seafood. Hominy stew made with dried lime-treated corn and combined with pork and seasonings. Made in a number of different ways, buy always with cheese filling (named after “queso”, the Spanish word for cheese). Usually a folded corn tortilla with a chile and jack cheese filling, fried quickly over high heat. (Native fresh cheese) Made with sweet milk and rennet tablets. It is allowed to set until whey can be separated from the curd. Served with sugar, syrup, or preserves as a dessert. Puffy, crisp, deep-fried bread. 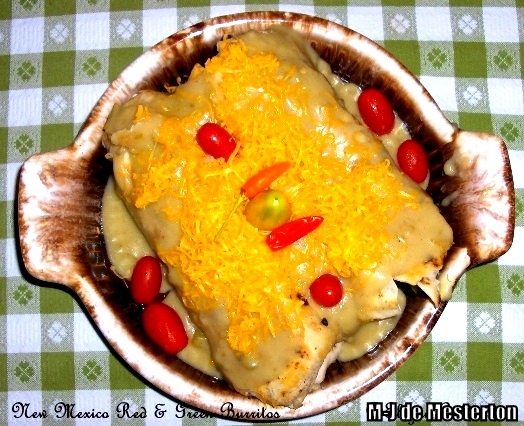 Accompanies many Southwestern meals, or may be stuffed with refritos or meat and topped with chile sauce, cheese, and lettuce. A corn tortilla folded in half and fried until crisp, stuffed with meat, or chicken, or refried beans. Before serving, it is topped with lettuce, onion, cheese, and taco sauce. Red chile pork encased in fresh masa and wrapped in a corn shuck. Usually steamed and served with red chile sauce. 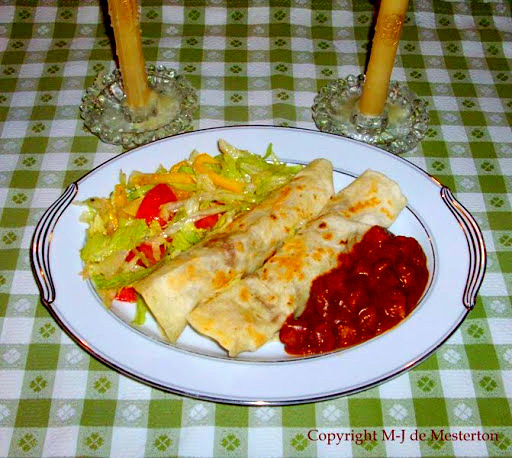 (Rolled tacos) Same as tacos except filling is placed inside tortillas and rolled cigar-fashion, then deep-fat fried. Stiffly beaten eggs leavened with baking powder and seasoned with salt and herbs, then deep fried. Served during Lent with chileor with a chile sauce as a meat substitute. Corn tortilla cups filled with chile con carne topped with shredded lettuce, chopped tomatoes, and grated cheese. Corn tortillas cut in pieces and fried until crisp. Salted or sprinkled with chile powder. Served for dipping with salsa, guacamole, or chile con queso. Bizcochitos — Anise seed cookies. Buñuelos — Fried sweet puffs that can be glazed with brown sugar-maple syrup or sprinkled with cinnamon-sugar. Sometimes, hot buñuelos are stuffed with vanilla ice cream. Capirotada — (Bread Pudding) Toasted bread topped with caramelized-sugar corn syrup, sliced longhorn cheese, raisins and cinnamon, and baked until cheese melts. Empanada — Fried or baked turnovers with either dried fruit or sweet meat filling. The name derives from “enveloped in bread”. Flan — Caramelized custard. Natillas — Soft custard topped with egg white and sprinkled with cinnamon. Panocha — Indian pudding made with panocha flour, brown sugar, and seasonings such as cinnamon and cloves. Pastelitos — Dried-fruit filled pies — usually apricot or prune or both. (Chick Peas) Cooked, mashed, and seasoned with salt, onion, red chile pulp, and cilantro. A large gray-brown root vegetable, delicious raw. Has a white, crisp meat resembling that of a potato or chestnut. Leaves or pads of prickly pear cactus. Taste and texture resemble green beans. Used alone as a vegetable or in soups, salads, and omelets. Spinach combined with pinto beans, seasoned with bacon and crushed chile pods. Cactus fruit ranging in color from green to red or maroon. The moist, granular flesh is good served raw as a dessert with lemon and sugar, but is also candied or used in desserts. A common garden weed served as a leafy vegetable. Also called purslane. A gruel-like blue corn-meal drink. Is either served with sugar, scalded milk, or both. Hot chocolate using Mexican chocolate as a main ingredient and seasoned with cinnamon, cloves and vanilla. At Christmas season, it is served with bizcochitos. Dust the albondigas with flour and fry in a tablespoon of hot lard (manteca) in a large, flat pan or skillet. When the meatballs are browned, empty them into a dish. Put a teaspoon of lard and a teaspoon of butter in the pan and heat it. Incorporate two tablespoons of flour and stir it till nut-brown, and then add a cup of water or milk very gradually with a whisk. Cook until the gravy no longer tastes like flour. I like to add a teaspoon of green chile powder or a lot of freshly ground pepper. Lay your albondigas in the gravy, cover the pan, and simmer for fifteen minutes. 1 pound (16 ounces) of lard (manteca)–no substitution! 1. Cream together the lard, sugar, and anise seed in a large mixing bowl. Add eggs and beat well. 2. Combine flour, baking powder, and salt in a large mixing bowl. 4. Knead dough slightly and pat or roll to a 1/4 inch to a 1/2 inch thickness. Cut dough into desired shapes. 5. Combine sugar and cinnamon in a small mixing bowl. Dust the top of each cookie with a small amount of mixture. 6. Bake in a 350°F oven for 10 minutes, or until cookies are lightly browned. * Varied amounts may be used. Bourbon or sherry may be substituted. NOTE: The fleur-de-lis shape is traditional for these cookies. Yield: 6 servings. Freezes well (May be frozen after frying). 1 pound sharp cheddar or Monterey Jack cheese, cut into strips1. Heat an amount 4 inches deep of shortening or lard (manteca) in a heavy pan on medium-high heat. 2. Slit chiles open crosswise below stems. 3. Insert strips of cheese into chiles. golden brown. Drain on absorbent towels. 5. Serve with red or green chile sauce. 2. Blend milk with eggs and add to dry ingredients. Mix well. 3. 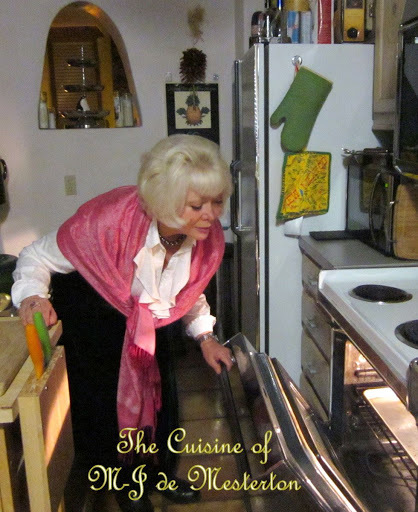 Proceed with step 4 of Chiles Rellenos recipe. Brush the bread slices w/ melted butter. Bake at 350* for 10 to 15 minutes until well dried but not browned. In a saucepan dissolve the sugar in the water, add cinnamon-stick and cloves. Bring to a boil, then barely simmer, uncovered, for about 20 minutes. Remove cinnamon and cloves. Reserve the cinnamon-stick. Place half of the bread slices in a medium baking dish so they crowd or slightly overlap. Top bread with 1/3 of the raisins, cheese, nuts and sour cream. Repeat layers. Decorate top with the reserved cinnamon stick. Pour the sugar-and-spice syrup over the assembled ingredients. Bake at 350* Fahrenheit for 20-30 minutes until the top is nicely browned. Because of the mysterious nation-wide salsa-related cases of salmonella, wherein no one knew whether the culprit was tomatoes, serranos, jalapeños or any other component of the sauce, I decided that I would cook mine. It’s a solution to the abundant tomato, tomatillo and chile harvest this year–I threw the tomatillos, tomatoes, chiles and a finely chopped onion into a big pot, where they simmered down to a sauce after an hour. If you like to add coriander (cilantro) or lime juice, leave them out till you’re ready to serve the salsa, because cooking them is a mistake. This week, I cooked up the last of my harvest and froze it in individual containers. To spike the flavor, I added both red and green pure New Mexico chile powders (no additives like cumin or comino).